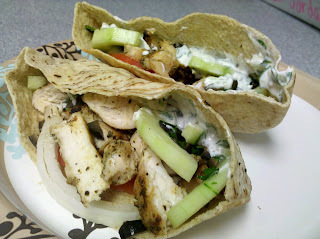 Playing around on Pinterest the other day I saw a recipe for chicken gyros and realized how long it's been since I've made them...plus I've never blogged it! mix yogurt, minced cucumber, 2 tbsp chopped parsley, 1 tbsp garlic in a bowl and let sit in the fridge for at least one hour for the flavors to mix. chop olives, mix in 1 tbsp of garlic, and 3 tbsp of chopped parsley. season with cayenne, salt, pepper, paprika, and Cavender's to taste. Grill until done and slice. How do you like those fancy plates and server ware? Jeremy has literally packed up everything except for what I am wearing this week, hence the paper plates and lame containers haha! 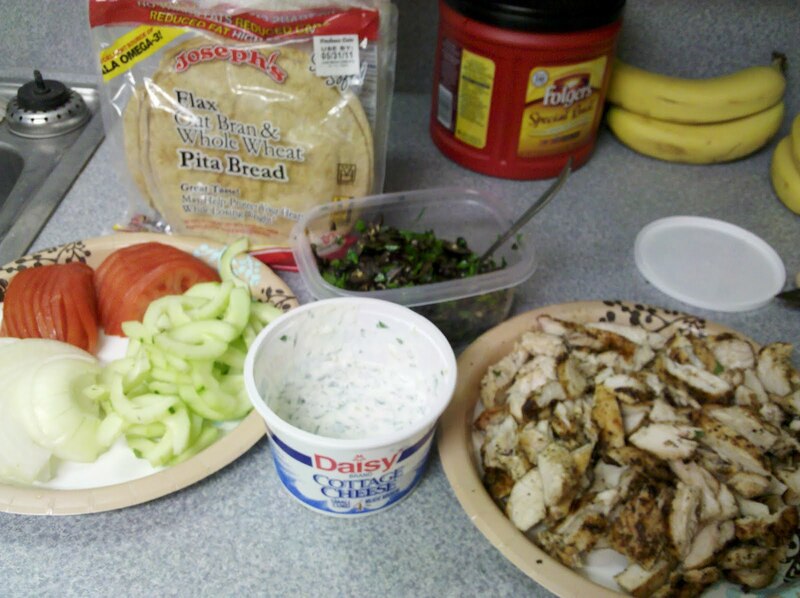 Cut pita in half, stuff with chicken, tomato, cucumber, and onion. Top with olives and yogurt sauce and feta. **when I did the nutrition info I totally forgot the feta, I also ate halfway through my gyro before I realized I never put feta on it. **Joseph's brand pita is a big factor in the calories for this recipe, one pita is only 60cal. If another brand is used adjust calories accordingly.